Enjoy Our Services -> Spread The Word -> Get Rewards! To all of you who share your positive Funio experiences, thank you so much! We appreciate it, and that is why it’s now time for us to demonstrate our appreciation by offering you the rewards you deserve. You might call it an “Affiliate program”. Others call it a “Referral program”. 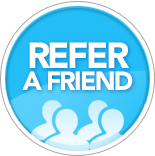 Some of us prefer using “Refer a friend”; the bottom line is the same. You get rewards each time you talk about Funio to someone who subscribes to our services. It’s that simple! For now, the Referral program is reserved to Funio customers that have at least an active product in their accounts. Each time you refer a new customer that subscribes with us with a Funio hosting plan, you receive a $50 credit to your Funio account! Each time someone you have referred adds a new Funio service to their account, you receive a credit equivalent to 10%of the purchase! Each time someone you have referred renews their services with Funio, you receive a credit equivalent to 10% of the renewal invoice! You can use your credits to get discounts on additional services, or even cover your entire Funio hosting services as if they were free services! There is only one restriction to receive your credits: the customer you refer needs to stay with Funio for at least 30 days, else you will lose your credit. This policy is only present in order to prevent abuse and fraud. How To Refer Someone And Get Rewards? First, all the information about the Referral program and rewards are available in the Customer Hub, in the “Refer A Friend” section. You do not need to subscribe: as a Funio customer, you are already pre-approved! In the Hub, you will find all the data on the credits you have received, the program’s terms and conditions, and much more. Note that this is the first draft of the interface, and you should expect it to evolve, like everything else at Funio. You have 3 ways to refer your friends, customers, business contacts and anyone looking for our services (and pocket all the rewards). Personalized link: At the bottom of the “Refer A Friend” section you will find your very own “Personalized URL”. You can use this URL on social networks, on your website or directly in an email you could send to someone who would require our services. The referral is fully automated and the reference will be tracked for a 60 day period. Banners: Add a Funio banner to your site! You will receive a credit for each visitor that clicks on it and subscribes to our services. The referral system is also fully automated. Fill a form: There are 2 reasons why you would fill out our forms. If you know someone that has not chosen a hosting company yet, let us know and we will get in touch with the person in question. If we convince him to subscribe, you will get your reward. If you told someone about our service and that person has subscribed, you have 30 days to let us know about it in order to receive your reward. We hope that, just like everything else we provide you, this program will be simple, easy, accessible, effortless, straightforward and painless! Get with the program now!